Extreame Savings Item! Save 46% on the Tangkula 4' Center Folding Adjustable Table Portable Rattan Design Indoor Outdoor Use With Carrying Handle by TANGKULA at Kerinci. 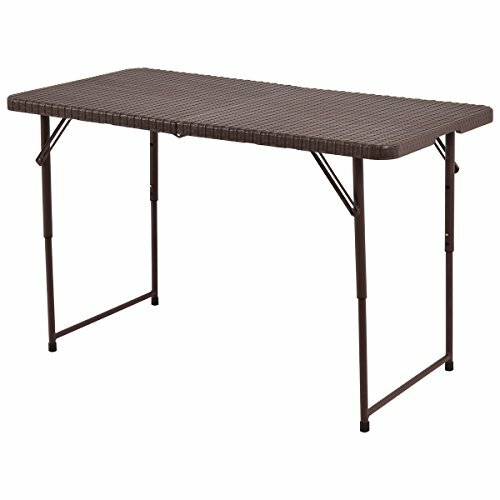 MPN: Folding Table. Hurry! Limited time offer. Offer valid only while supplies last. This Portable Folding Table Has A Rattan Design Which Will Bring You A Large Table Space Quickly Since It Can Be Fold Or Unfold Within Seconds. This Portable Folding Table Has A Rattan Design Which Will Bring You A Large Table Space Quickly Since It Can Be Fold Or Unfold Within Seconds. Constructed By Excellent HDPE & Sturdy Steel, It Is Sturdy To Use In Picnic, Camping, Party, Outdoor BBQ, Dining Etc. Light-Weighted, Convenient To Carry & Space-Saving. The Height Of This Table Is Also Adjustable So That You Can Make Adjustment Freely. Easy To Clean With Rag And Soap. You Will Enjoy A Happier Leisure Time With It. Do Not Hesitate To Buy One! Water-Proof, Heavy-Duty, Not Easy To Fade Color And Aging. Convenient Folds In Half, With A Handle, Easy To Storage, Carry, Space-Saving. High Stability--With An Interlocking Midsection To Strengthen Central Area And Legs Lock In Place Firmly.